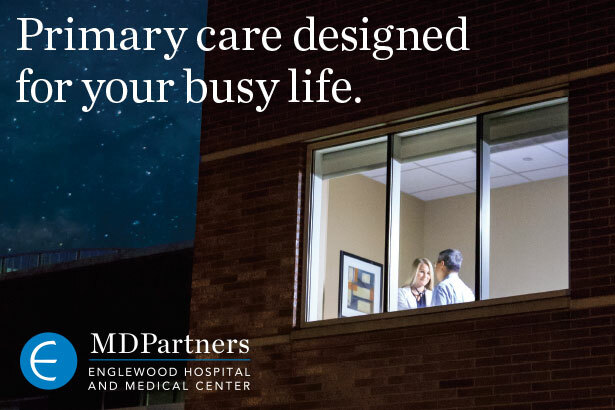 December 12, 2016 — MDPartners, the physician network of Englewood Hospital and Medical Center, has opened its doors on a new primary care practice in Bergenfield. The practice is unique in that is offers primary care specifically on evenings and weekends for busy professionals, students, and others who can’t always see a doctor during the day. The practice offers seamless access to specialists in the full MDPartners network, which comprises more than 300 primary care physicians, specialists and other practitioners in northern New Jersey and Rockland County, New York. If a patient is experiencing a true emergency, the practice will quickly have the patient transferred to the emergency department at Englewood Hospital and Medical Center. MDPartners – Bergenfield, located at 1 North Washington Avenue in Bergenfield, offers service for sick visits, non-emergency injuries, routine vaccinations, and other primary care needs. Patients have access to an online patient portal. The practice accepts nearly all major insurance plans and offers free onsite parking. Hours of operation are Monday – Friday, 5 p.m. to 11 p.m., and 9 a.m. to 5 p.m. on Saturday and Sunday. The phone number is 201-374-9106.